The Buckeye Trail is a 1, 444-mile loop that winds its way around Ohio. According to the Buckeye Trail Association, a nonprofit group that manages and maintains the trail “a hiker can experience a little of all that Ohio has to offer.” The Cuyahoga Valley National Park (CVNP) is home to 37 of these miles, which the Park’s Trails Council has divided into several segments of varying difficulty ranging in length from 1.5 miles – 7 miles. Take I-77S to Exit 146 toward I-80/Toledo/Youngstown. Keep right and follow the signs for Ohio 21/Richfield/Brecksville. Turn right onto Brecksville Road. Turn left on Snowville Road. Turn right on Riverview Road. Turn left on OH-303 S/Streetsboro Road. Turn left onto Pine Lane, where you’ll find a parking lot, a map kiosk, and a Buckeye Trail marker. The ever-changing landscapes along the trail make it wonderful. 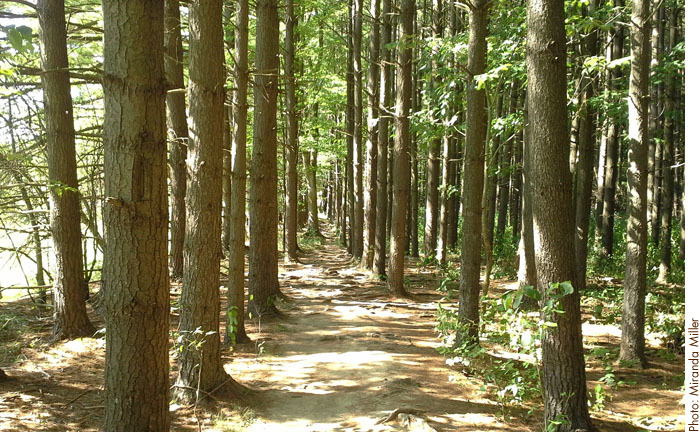 There are forests of pine (including a stand of rare white pines near the middle of the hike), oak and hemlock; orchards; ravines, and special spots where you are surrounded by a variety of plants, wildflowers, and birds. There is even some highway viewing mixed in, and while that may sound like a deterrent to your peaceful day out in nature, don’t be too quick to judge. There are some amazing views along the road that provide great photo opportunities. Because the trail offers so much variety in it setting— it’s ups and downs (some more challenging than others), creek crossings, pedestrian bridges, and other natural obstacles to maneuver around—be sure to keep your eyes out for the blue blazes that mark the Buckeye Trail. The trail is well-maintained and well-signed, so finding your way should not be a problem. And, if you do decide to end your hike at the Boston Store Visitor Center, you are in for a treat. It’s a historic house built around 1836, and it offers all sorts of goodies and memorabilia to commemorate your awesome hike along the Buckeye Trail. Hikers looking for a trail with a wide variety of terrain to explore will find this hike enthralling. Those looking for a bit of a longer trek will be happy to find it very easy to add some distance onto their hike with the nearby Towpath, the rest of the Buckeye Trail itself, or one of the Buckeye’s shorter off-shoots. It’s also a great trail for bringing along your furry four-pawed friend as well.